Each of our children longs for a family where they feel loved and included. Our deepest desire is to see their dreams come true by being reunited with their birth families or placed in adoptive homes. For the times when this dream doesn’t come true, our staff dries tears, answers questions, and stands in the gap. 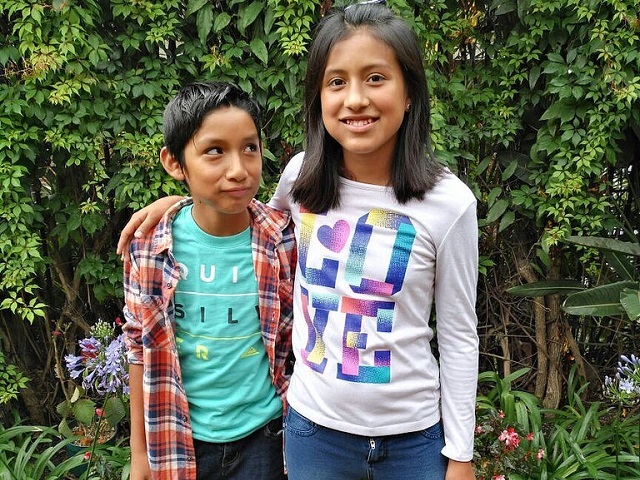 Before coming to Dorie’s Promise, Flor and Mateo were living with a Guatemalan family and in the process of being adopted. We’re not sure what happened, but the adoption proceedings stopped. Afterward, the court referred them to our home. Unfortunately, placements don’t always work. As you can imagine, Flor and Mateo were disappointed when they came to Dorie’s Promise. Being adopted together is their dream. Having that taken away was too difficult for them to understand. They couldn’t imagine what they could have done differently, to have a family. From the moment they came to us, we knew how much they loved each other. Their bond helped them endure their disappointment. Not only did they lose their adoptive family, they also moved nearly 4 hours away. Dorie’s Promise wasn’t their first choice. They were abandoned by a family, moved, and wanted to return to the orphanage where they grew up. More than anything, they want to be with people they knew and who loved them. We understood how much they had lost, and knew we needed to earn their trust. One year later, things are completely different for Flor and Mateo. She might seem quiet when you first meet her, but once she opens up to you, you’ll be amazed. Flor is one of the smartest girls in our home. Not only does she speak English well, she also wants to learn more languages. Her teachers are amazed by how well she does at her bilingual school. She’s so bright that we’re constantly trying to find new ways to challenge her. Even though she still misses her old friends, Flor has really connected with the other children here, especially Jennifer. They attend the same school and both love art. Seeing Flor feel safe enough to build friendships again gives us hope that she is healing. Mateo is one of the funniest boys in our house. He keeps the Special Mothers laughing each day as he recounts his school day adventures. Being able to connect with Brayan has given Mateo an older role model in our home, someone to learn from and hang out with. We’ve also seen him take on the role of older brother to the little boys as well, teaching them to build new creations with Legos. Just like his older sister, Mateo is also very smart. He has overcome the challenges of their move, while also attending a bilingual school. We know he’s going to do great things because Mateo is a triple threat—smart, funny, and caring.